2 Pack Conductive Touch Screen Gloves Only $2.99 + FREE Shipping (Reg. $30)! You are here: Home / Great Deals / 2 Pack Conductive Touch Screen Gloves Only $2.99 + FREE Shipping (Reg. $30)! Hurry! Right now you can snag this awesome 2 Pack Conductive Touch Screen Gloves for only $2.99 + FREE Shipping (Reg. $30)! 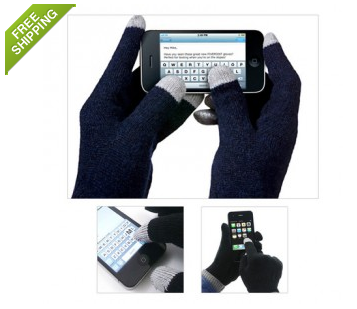 These gloves have specially charged fingertips that allow you to use touchscreen devices!